When I tell people that I work at a library, a common response is to ask whether I sit around reading books on the job all day. Although asked jokingly, the stereotype contains a kernel of truth and points to a real site of conflict. I’ll term this the problem of reading at the circulation desk. At all but the busiest libraries, the worker checking books in and out will have periods of inactivity between transactions. It’s only natural that she will turn to the materials at hand – books and a computer – to pass the time in the intervals. Management often does not see this as a logical response to the cyclical, uneven nature of much library work. Not only have I been forbidden at certain libraries from reading at the circulation desk (once with the explanation that it gave an impression of laziness to the public), I’ve often been made to fill the spare moments with menial tasks as banal as highlighting the library’s web address on due date slips. The same conflict occurs across the division of labor, not only at public service points. Certainly this “time to lean, time to clean” mentality of enforced productivity is not unique to libraries, but it takes a peculiar form here, where the means of production, so to speak, are things of edification and pleasure. I would characterize this material conflict between library workers and management over reading books and newspapers, using the internet, etc. during working hours as a manifestation of an alienation inherent to the work. An asymmetry exists between library users and workers. Library users, those who access and enjoy library resources, are not library workers, but library workers are always potentially and simultaneously library users. Management discipline cleaves this potential coincidence, at least during waged time. An area of antagonism opens every time a library worker attempts to access the uses and pleasures of the library in the same way as users. Where discipline prevails, which is nearly everywhere, the foreclosure of use alienates the library worker from the materials they handle, work up, and could potentially also enjoy. Creative, critical, and leisure materials are reduced to mere things to be tracked, transported, and altered according to the dictates and standards of someone else. Encounters with others are likewise rationalized and reduced to reference interviews, circulation transactions, lending requests, policy enforcement. Beneath the veneer of literacy and knowledge, the library is a site of work, and therefore of struggle. To write of the “library worker” runs the risk of collapsing the extreme variety of labor performed in these institutions. First, there are a variety of types of libraries – typically subdivided as public, school, academic, or “special” libraries – that serve different populations and have vastly different types of holdings. Second, each library itself has a division of labor, often complex and highly variegated. The gap between a page in an underfunded urban public library and an archivist at an élite research library may be such that their experiences are mutually unintelligible. Despite this heterogeneity, I believe that the category of the library worker, as opposed to, say, the library page, cataloguer, or children’s librarian, is useful. It emphasizes the shared working identification with the library, institutions which, despite their variety, have coherence in the social imagination. Additionally, despite the many differing ways we may work with it (literally handling it, describing it in metadata, interpreting and transmitting it to users, etc. ), information is the common material library workers meet at the work site, however obliquely. To illustrate this variety and commonality, I’ll describe two very different libraries I’ve worked in. A small neighborhood branch in a large urban public library system. Seven employees, four full-time and three part-time, staff a single desk, where the usually separated functions of circulation, reference, computer lab help, and children’s area are consolidated at a single point of contact with users. Although all staff perform these functions while staffing the desk, there’s a huge gap between the wages and benefits of part-time workers, making just above minimum wage with no benefits, and full-timers. Yet aside from some specialized tasks, relatively high and low-paid workers perform the bulk of library duties interchangeably, regardless of how much formal training (in library school or the district headquarters) they’ve received. On weekends and evenings, a single employee may operate the entire branch for periods of time. The distance from system headquarters and small size makes for informal and familial relations that mask the hierarchy of wages. The modest footprint of the library creates a ratio of public to “private” work space of about ten to one. In effect, there’s no place to hide from users. Being open to the public at large brings to bear on the branch’s workers a large and frequently surprising number of requests for assistance, often beyond the traditional scope of the library. Circulating books and videos, assisting with computer programs, and fielding student reference questions are the bulk of it, but not uncommon are solicitations for medical advice, pleas for welfare resources, and more delicate interactions with the mentally ill, senile elderly, and rowdy teens. We are proxy social workers, relationship counselors, security officers, and teachers, but often fumble through these roles given the lack of formal training. The social value of our efforts is of course not reflected in our paychecks. Maintenance and ordering of materials round out the work load, although cleaning the branch is left to housekeepers who come in overnight. The surrounding area is affluent enough that the branch is not staffed with a security guard. Several years later, at a cubicle in the main library of a large research university. The building, itself divided into dozens of smaller departments, special collections, and institutions, is one of several libraries spread across campus. Hundreds of employees work for the library, performing specialized tasks in a division of labor only intelligible by complex organizational charts. A small army of student workers supplement the more menial work flows at very low wages. In addition to those of us who directly operate the library are auxiliary workers – security guards, janitors, and food service workers in the library café. The division of labor is extreme. An individual worker’s tasks may be as rote and repetitive as shelving or marking books all day, or as stimulating and creative as developing digital archives or assisting scholars with priceless rare books. A cataloguer may work for decades without encountering a library user, while a reference or instructional librarian’s job is premised upon interacting with them. The size and complexity of the library necessitates a thick administrative layer. Workers may form friendships within and across work units, but the convolution of the workplace resists coherent collective identity and self-organization. Endless proposals to improve “work culture” and organize staff social events are symptomatic of this condition. A much larger percentage of the library’s footprint is non-public – housing special collections, technical departments, offices – and the division between those who work in public and private areas is registered in both stress and prestige. In this anti-union Southern university, wages are generally low, although they can vary wildly, with librarians, department heads and those attached to special projects with rich funding streams taking home far more than most staff, especially auxiliary workers who toil near minimum wages. These two experiences illustrate the variety of forms library work takes, and they are only a limited sample. A more formal classification would distinguish not only between types of tasks, but also consider the educational and cultural determinants of workplace hierarchies. An important initial distinction is between librarians, who typically have several years of specialized graduate education, and all other library workers. Librarians generally enjoy higher salaries and greater autonomy and prestige, and more potential for advancement into administrative ranks. (Although it’s worth noting that, due to a glut of library school graduates, many workers with library science graduate degrees labor in non-librarian positions.) Less restricted by burdensome educational and cultural prerequisites, non-librarian workers are more heterogeneous racially and economically. Although many of these positions (often termed “paraprofessional”) bring home decent pay, at the lower end they approach minimum wages (an acquaintance who worked at a public library in New York City had many co-workers who received food stamps and Section 8 housing vouchers). Paraprofessionals are excluded from library professional associations and tenure protections at academic libraries. The introduction of new technologies into libraries continually scrambles the division of activity. Nevertheless, a general typology of labor can be outlined. Least visible to the average library user is a stratum of specialized professional and technical activities, performed by workers often tethered to computers in cubicles and offices. Acquiring and classifying materials, assisting administrative planning, maintaining catalogues and library systems, digitizing print material, and maintaining special collections all fall into this category. More visible are reference and instructional workers, usually but not always librarians, who assist users in finding and interpreting information, frequently now in the form of navigating the internet. Those who perform public service, clerical, and manual labor are far less likely to have the status of librarian. These workers handle and circulate the physical resources not yet rendered obsolete by digitization. As the “front line” of the library, they often must perform “extra-library” responsibilities librarians are rarely called upon to face. Finally, labor in auxiliary sites and functions connected to the library but not “of” it: security guards, baristas in library coffee shops, gift store clerks, janitors, etc. These types of activity are discrete neither in theory nor practice; a single worker may traverse several areas, and different units of workers, perhaps separated by continents, may contribute to the same process. Being on the front lines, ie in public service areas of a library, adds stress to the job in two ways. Like other service workers under the thumb of contemporary management practices, workers in public areas of the library are subjected to unrealistic demands that go by euphemisms like “service excellence” or “service orientation.” This importation of business ideology may vary in its impact on day-to-day experiences, but it nevertheless legitimates increased surveillance and discipline. The personality of the worker who deals with the public is up for scrutiny to a higher degree than that of a cubicle-bound library worker. The same circulation and reference workers also labor in a less predictable, often more stressful environment. With the defunding of social services, the library is one of the few open-door providers of resources left to the public. Library workers are well equipped to handle requests for information, including providing access to computers for job and welfare applications. They are neither trained nor prepared to be the proxy social workers they become by default. Public libraries in particular can wind up serving as day shelters for the homeless, and after-school childcare. Although academic libraries can readily restrict access, public libraries, for practical and political reasons, cannot. The policing of “legitimate” versus “illegitimate” library uses devolves to frontline workers and security guards. These rules can turn on absurd distinctions. Homeless people may sit at library tables as long as they like, but only if they stay awake with a book or paper open in front of them. They may bring in one bag but not two. Teenagers may not use the library before the end of the school day. Children must be accompanied by an adult, but older siblings don’t count. Policies vary from library to library, but everywhere the enforcement of arbitrary rules inevitably leads to conflict between library workers and library users. Naturally many workers resent having to perform the functions of daycare workers and police officers on top of library tasks. A cynical division opens up between often underpaid library workers and those simply in search of shelter, heat, air-conditioning, or bathrooms. This cynicism feeds back into the logic of austerity that has eliminated social services in the first place, rendering the library yet another pathological public site of undesirables. Certainly not all interaction between library workers and users is negative. Indeed, the opportunity to serve the public in a non-commercialized space can be a source of solidarity and joy. Shared experiences of frustration and gratification among frontline workers can exacerbate another division within the ranks of library workers. At a large public library I worked at, it was expressed as an upstairs/downstairs division, with all the connotations of an Edwardian estate. The first floor housed the circulation, children, and young adult departments, in addition to a security stand and gift shop; upstairs were the administrative suite, librarian offices, and special collections. Policy changes sent down from above were met with skepticism and often ignored, “upstairs” being shorthand for aloof ignorance. The physical and cultural distance between floors allowed for a degree of “counter-planning” on the circulation floor. A third labor/spatial division in addition to public and private in libraries is that of commercialized space and service work. It has become a common practice for new and renovated libraries to include cafes and gift shops in prominent locations. Not only do these spatial conversions bring commercial transactions into what are typically non-commercial institutions, they also literally bring food service and retail workers into the library, side by side with traditional library workers. These newcomers should be, but are most often not, considered library workers proper. The difference between checking out a book and ringing up a muffin is scant, and the policing performed by a library assistant and a security guard mainly a matter of degree. Yet these service workers are often deliberately separated from library workers proper. Outsourcing café labor to food service contractors, or relying on volunteers to staff a gift store erects a wage and organizational firewall between workers. Uniforms and irregular scheduling reinforce this artificial division. Faced with either a rearguard struggle against library commercialization or a progressive struggle to unify all workers within the library’s walls, library workers’ organizations have chosen neither. The differentiated labor and rewards of librarians, paraprofessionals, and auxiliary workers are not stable. Deskilling and outsourcing touch each area, conforming to at-large trends: aside from some highly specialized functions, library workers find their activity more and more interchangeable, potentially and actually, with masses of other workers, or replaced outright by machines. 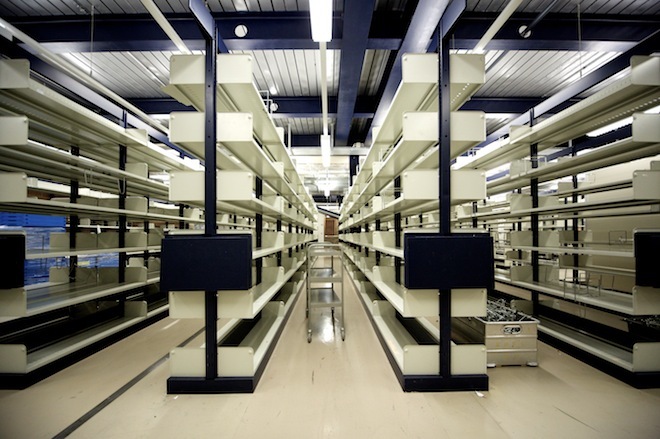 Computer automation, beginning in the 1970s, and digitization of print and video resources beginning in the 1990s have weakened the library’s monopoly on information provision and brought many library tasks into conformity with practices common across sectors. Book circulation articulated through computer terminals, barcodes, and databases varies little from the labor of a grocery store cashier. Pages replicate the rote manual labor of retail stockers or Amazon warehouse order pullers. Cataloging and reference work finds resonance in IT and call center work, respectively. In my experience, this process of automation was felt most powerfully in the past fifteen years as a turn from material and interpersonal interactions to a mere “minding of the machines.” Facilitating access to the internet and digital resources – whether digital audiobook files for tech-savvy suburbanites or online job applications for the working poor – is now the primary, or even sole activity at many libraries. For the workers here, monitoring banks of computers and self-checkout terminals has replaced the sensual and intellectual activity of libraries past. Outsourcing further threatens the stability and security of library workers. External outsourcing is not limited to the subcontracting of security and food service labor previously mentioned, but extends to highly skilled and specialized library work such as cataloging. Entire public library systems have even been privatized by local governments and handed over to companies with the same raider mentality and zest for labor suppression as charter school operators. Internally, much work is outsourced to volunteers and extremely low paid part-time high school and college students (often work-study arrangements). This low-wage or unpaid labor is often poorly done, creating more unacknowledged work for regular staff. Although many forms of library work remain unchanged or only slightly modified, library workers, like workers in general, face a situation of technological flux and increased precarity. Our insecurity is compounded by an ideological calling into question of the very existence of libraries. As discussed above, library workers range from librarians with solidly “middle class” wages and social prestige to interchangeable temps making minimum wage. Wages, working conditions, benefits, and job security vary widely. Generally, higher wages correlate to higher union density. In my own wage history, I made $14,000 a year more working roughly the same job in the Northeast than in the anti-union South. When libraries are unionized, affiliation and configuration of the union can vary. Often a library is but one worksite in a larger local representing a municipal workforce, college, or university. Libraries with unusually large workforces may constitute their own local. Unsurprisingly, the union is just as likely to reinforce division as it is to build solidarity across the division of labor. Different unions may represent librarians and paraprofessionals, or may ignore some library workers like housekeeping or security altogether. Even within the same local, different bargaining units may negotiate at cross-purposes or accept grossly unequal wage and benefit structures. It’s obviously difficult to generalize the experiences of library workers in their unions, but suffice it to say, as in the labor movement at large, union representation does not necessarily correlate with militancy or an organizing horizon beyond wage and working condition demands. How do library workers relate to their unions? As truly representative bodies? Another layer of bureaucracy? A remote abstraction, only thought of when filing a grievance or preparing to strike? In lieu of an objective survey, I’ll describe several situations I experienced, or that my friends experienced, in unionized libraries in the urban labor strongholds of the Northeast, where I live. Several acquaintances have worked in major cities for very large public library systems, where thousands of employees are grouped into even larger municipal unions representing both white- and blue-collar workers at hundreds of other non-library sites. The sheer size and complexity of the organizations render them remote, and the enormous district councils are perceived to be absorbed in municipal power politics as much as or more than they are in rank-and-file experiences. In one case, library employees at a nearby community college are represented by a local smaller in scale, but likewise convoluted by diversity of membership. Affiliated with a national teacher’s federation, this union includes nearly all of the college’s employees, from tenured faculty down to groundskeepers. Although this inclusiveness strengthens bargaining power, it tends to marginalize work units that are dwarfed by the larger blocs of instructors and office staff – such as the library. As a result, library workers’ relationships to the union are ambiguous, and largely colored by individual experiences on the picket line or in grievance processes, or for some younger workers, their political convictions. Finally, an academic library with its own freestanding union local, representing and accountable solely to the concerns of library staff. Participation and attentiveness to leadership activity are far higher here than in the previous examples, obviously stemming from a smaller scale that flattens distances between the rank and file, stewards, and leadership, and responds with greater focus to the specificities of library labor. Even at the entry level, library jobs are competitive. This was the case even before the 2008 crisis, and has been exacerbated since as austerity forces cuts and closures. Like the education and nonprofit sectors, libraries promise a limited refuge from the barbarism of the marketplace. An aura of literacy, culture, and democracy draws many, and can compel workers to accept lower wages than they might make in the private sector. Many refugees from related professions (teaching, social work, IT) vie for jobs, as do liberal arts graduates lacking professional qualifications. In a trend certainly not unique to libraries, there is a marked generational difference between the class background and educational levels of older and younger workers, as many newer workers enter menial paraprofessional jobs holding undergraduate or even graduate degrees. An overabundance of aspiring librarians is produced by a graduate school industry issuing more degrees (Master of Library and Information Science, or MLIS) than available jobs. This glut is articulated with a management strategy of flexibilization and casualization that replaces a single full-time librarian with several part-timers, or contracts librarians by the semester or project. How to distinguish oneself from the desperate ranks of the librarian reserve army? Unfortunately, a common approach seems to be to adopt the au courant management rhetoric and style of innovation, entrepreneurialism, and competition. The image of the young, hip, tech-savvy librarian is immensely appealing to administrators eager to demonstrate the continuing relevance of their institutions. Fluency with social media, apps, and the like, although of debatable relevance to libraries, plays well in the environment of technological fetishism that exists across the managerial class. Those of us on the sidelines of this convergence of hip innovation and neoliberal management watch helplessly as book stacks are converted to “digital commons” resembling an Apple store, and funding is diverted from keeping neighborhood branches open to social media campaigns and app development. Twilight of the Library Worker? With its connotations of literacy, democracy, knowledge, public service, and free speech, the library continues to enjoy considerable prestige and support. Without these ideological and affective investments, the library may not have survived the decline of the welfare state and neoliberalization of the academy. The future of libraries and library workers is threatened by the convergence of two pressures. These pressures are typically seen as aligning with conservative forces on the one hand, and progressive on the other, leaving workers without a clear political direction of activity. From the Right comes the neoliberal austerity demand that public services justify their funding based solely on market criteria. This pressure is exerted not only on public libraries and schools, but is felt in publicly-funded academic libraries and archives as well. Even private institutions, which have seen their endowments devastated in the 2008 crisis, are wringing their libraries for savings. Although library closures and layoffs are considerable, as important as the drying up of funding is the closer monitoring of library operations and a fundamental shift in attitude, demoting libraries from their status as community necessities to luxuries. Even if minimal funding streams keep doors open, workers’ pay and benefits are subjected to greater scrutiny. Right-wing and centrist politicians join with mainstream media to beat the drum of fiscal discipline in the form of worker take-backs, wage freezes, increased productivity, and benefit reductions. From “progressive” quarters the questioning of libraries takes the form of a techno-utopianism demanding free and open access to information. From this ideological perspective, traditional libraries are outdated impediments to flows of information, library workers the unjustified gatekeepers of resources that want to be freely shared. The power of this worldview is evidenced by libraries’ uncritical embrace of automating systems and commercialized digital culture under the guise of progress and freedom. Many academic and even public libraries scramble to take their place as the quaint handmaidens of Google, Apple, and Facebook, possibly rendering themselves obsolete in the process. Again, this pressure may not shutter library doors, but it contributes to worker deskilling and the conversion of libraries into vast computer labs and library workers into machine-minders. For workers with more autonomy, especially librarians, access to professional and educational resources (such as training in IT and “entrepreneurial” knowledge) may facilitate the adaptation to these ideological and material pressures. Powerful professional organizations and national accrediting boards are one bulwark against library dismantling, but ultimately are themselves susceptible to the same pressures. Rank-and-file technical and service workers simply wait for the hammer to fall. The easiest response is to close ranks with the managerial and administrative class in a joint defense of the library. These campaigns typically appeal to both the classical values of liberal democracy and contemporary market values, where libraries are rebranded as incubators of innovation. By collaborating in this way, library workers lose whatever autonomous perspective they may have had, implicitly accepting the hierarchies of the workplace in a bid to survive. Where and how an autonomous viewpoint might develop into an alternative political program, one that both defends the material interests of library workers and develops the liberatory potential of the library, is beyond the scope of these notes. Image thanks to Thomas Guignard.